The Kindle Paperwhite and the Kindle Touch now have a feature that allows you to report errors to Amazon directly from the book you are reading. Amazon then collects the information and sends it to the publisher. 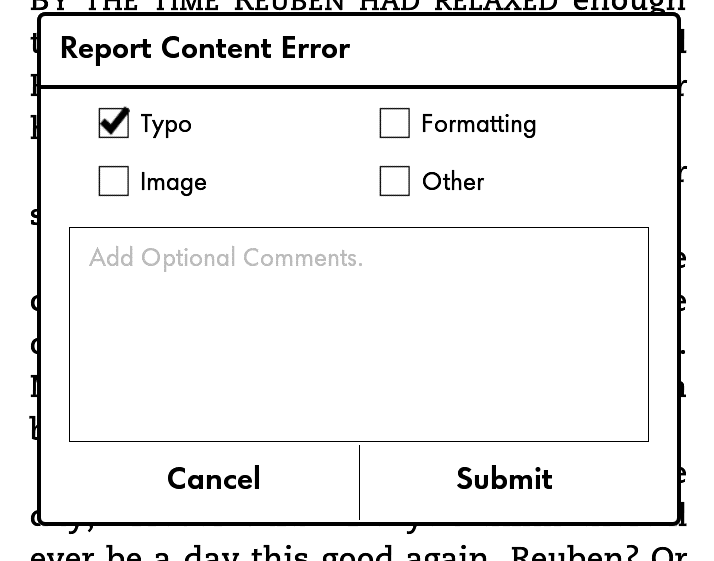 Simply go to the word (tap & hold on the touch screen), go to MORE, then Report Content errors. This is great for format issues or typos! It has been available on the Kindle App for PC for a while but this is great to have on the devices. I have reportted numerous typos via my Kindle. How can I see what is submitted? Go to http://kindle.amazon.com. Upper right, drop down menu, go to "Your profile." 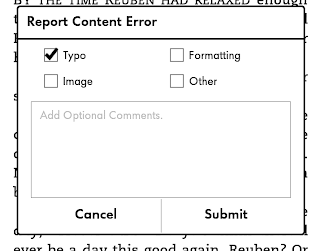 Then look at the bottom of the list at the left and click on the number of corrections at the bottom.